The musical soundtrack to the 'Emerald Moon Over Dirty Lake' picture-book is now finally available, and we're playing this show to celebrate & commemorate! 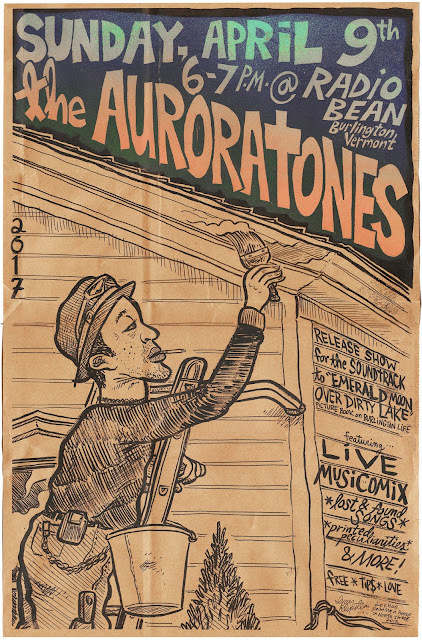 The Auroratones, an audio/visual project featuring central member Ivan Klipstein will be performing the latest "Musicomix"... original songs performed live in-synch with original comics & drawings which illustrate the musical stories. A short but very sweet performance at a responsible hour, it'll be from 6-7 PM. Copies of the book & all our other comics, musical recordings, and combinations thereof will be on display & available for sale as well... The music can now be heard (and downloaded for free by book owners) here... We hope to see you there!